As a single girl in the City, I’ve not only grown accustomed to dating, I’ve developed a taste for it. What can I say? I love to date. Of course, not every date is dazzling or disastrous. Some dates are O.K. and the same can be said of restaurants. 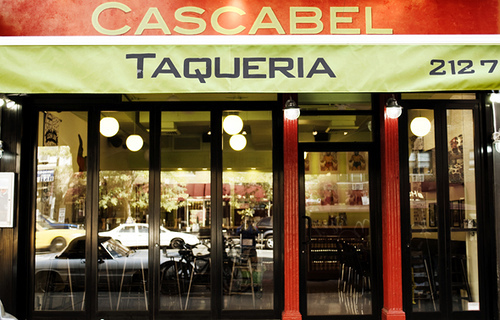 Case in point, Cascabel Taqueria. I have to admit, I was really excited about Cascabel. 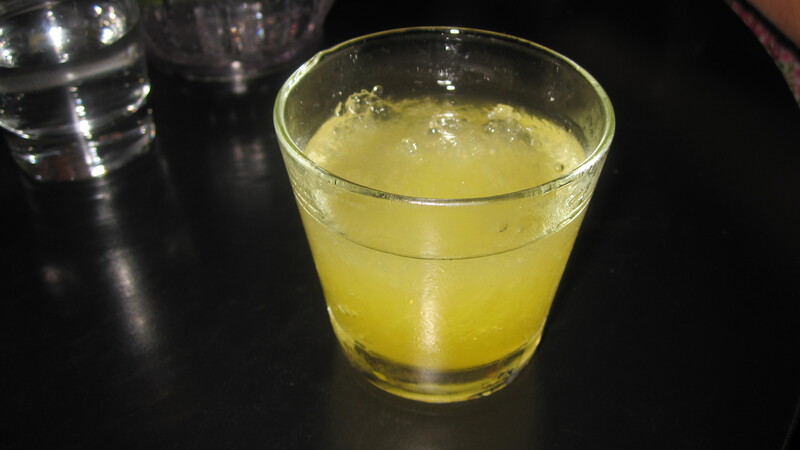 My trusted sources at Immaculate Infatuation rated it an 8 out of 10…that is until last week. They revisited the restaurant and revisited their opinion and determined that an 8 was too high. Cascabel now has a 5.7. After my recent visit, I understand the rating, neither high nor low. Cascabel is an eccentric little taqueria on the Upper East Side, and what I thought was the perfect location for a night out with great friends. Although they don’t take reservations, we were seated right away. I heard about their tequila snow cones before I got there, so we ordered a round of cones for the table to get the night started. Obviously. While they were tasty, the snow cones weren’t cones at all. They were shaved ice in a glass with tequila. So, basically they were extra frozen margaritas. There are a few things I never joke about, tequila included. So, this was a disappointment. Not enough to ruin a night with great friends. After all, it’s not like they were trying to serve us bad tequila. Now that would be a deal breaker. We started with guacamole. Each chip was one large tortilla, which I thought was awesome, a little hard to eat, but awesome nonetheless. 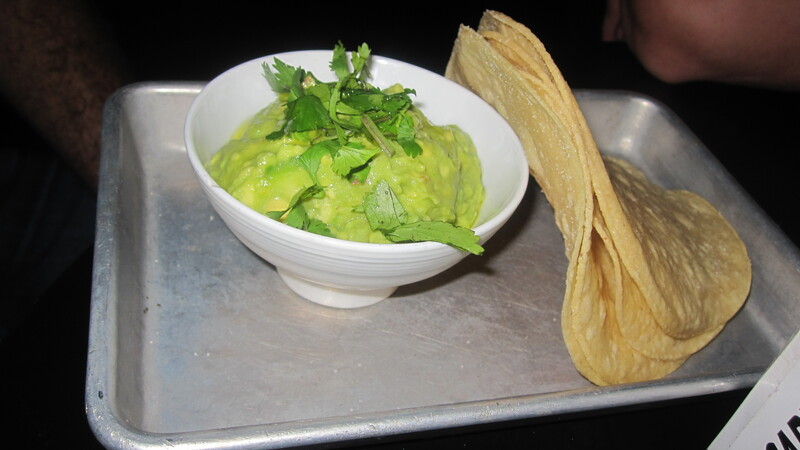 The avocados were so fresh but the guacamole was overly salted. I felt myself bloating by the bite. 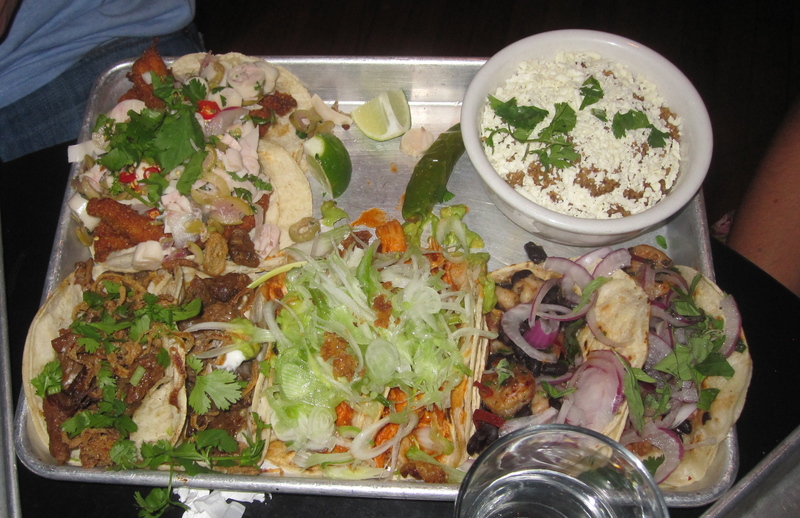 We ordered 4 different kinds of tacos to share – pescado, camaron, pollo chipotle, and carne asada. For those of you who don’t remember your high school Spanish, here’s a little cheat sheet: pescado – fish; camaron – shrimp; pollo – chicken; carne – meat. The pescado taco was filled with crispy yellowfin tuna belly, hearts of palm, olive and onion. I took one bite of this taco and had to put it down. I have an allergy to spicy food, and guess what was in this taco? Chiles. A chile is typically one of those ingredients that is listed on a menu, or at least a dish with a chile is indicated as **hot**. With no indication, there’s no stopping me. Unhappy with the first taco, I moved onto the second: the camaron taco. The camaron taco had roasted shrimp, fresh oregano, garlic, chili oil and black beans. There were a lot of beans in this taco, maybe even more beans that shrimp. Not what I was expecting, but not bad. The pollo chipotle taco had amish chicken, avocado, green onion and chicken chicharron. This taco was one of the better tacos we had. The chicken was packed with flavor. The taco was one texture though. It definitely could have benefitted from a little crunch. The carne asada taco was my favorite, filled with grilled hanger steak, oyster mushrooms, house cream and crispy onions. The steak was tender and satisfying. Onto the sides…grilled corn and quinoa. 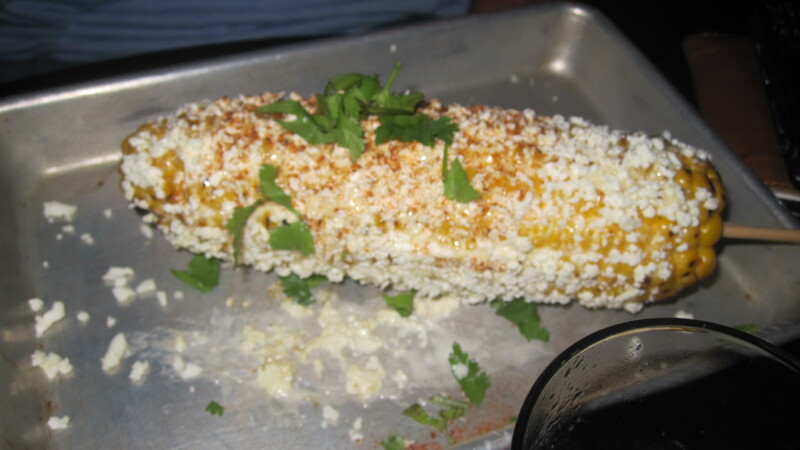 The grilled corn, which was covered in Mexican aioli, lime, and queso cotija, was sweet and creamy. I love the taste of the grill, especially on corn. And how could adding cheese be anything but great? Warning!! This is a “leave your manners at the door” dish, because there is no polite way to eat this corn. Just try not to smile right away. You know I love quinoa, but there was nothing exciting about Cascabel’s quinoa. Mixed with a little queso cotija and cilantro, it was rather boring. Not bad, just boring. Just like the tequila snow cones, the churros were not what I was expecting. 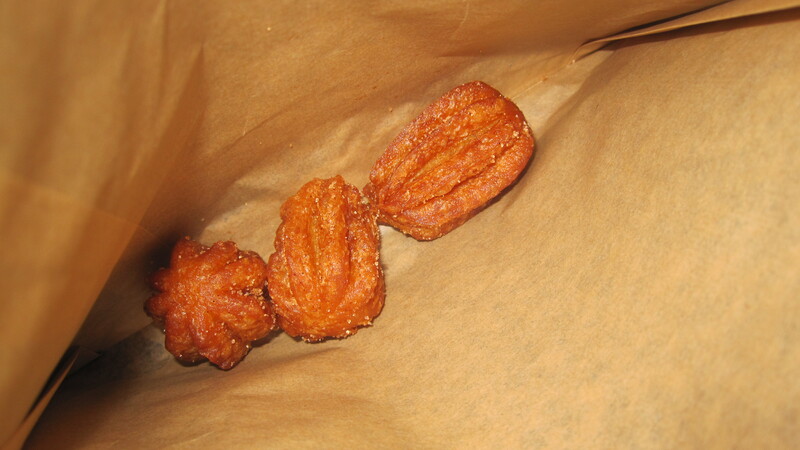 Rather than churros sticks, we were served churros nuggets. Three nuggets to be precise. There were four of us at the table. The worst offense though, was that they weren’t fresh. A little tequila goes a long way, especially when it’s good tequila. And good tequila I had indeed. 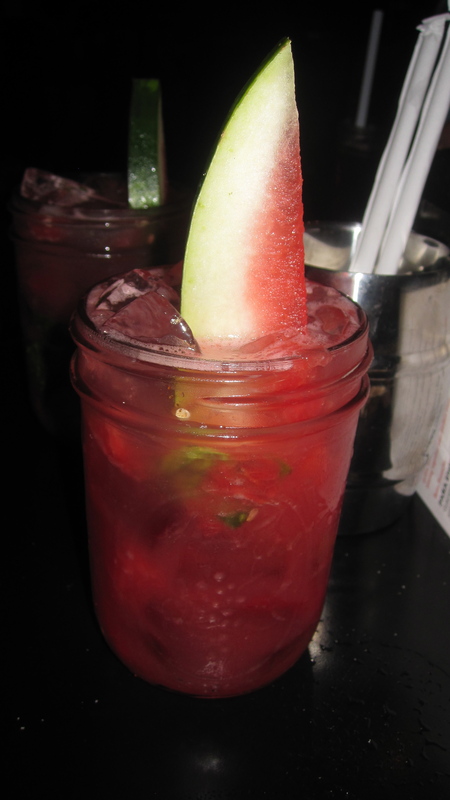 The watermelon margarita was sweet, tangy and refreshing. Good drinks and great company was enough to make this a great night. But the food left a little something to be desired, just like an O.K. date. Sorry Cascabel, you seem great, you really do. But I’m looking for something casual with you. Ya know, every once in a while. We can see each other, I’m just not ready to commit to you. This entry was posted in Restaurant and tagged Fun, Mexican, Upper East Side. Bookmark the permalink.